Compact, upright habit with leathery dark green leaves. 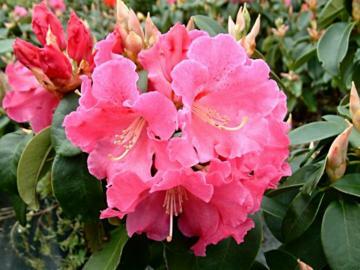 Large trusses of funnel-shaped, bright reddish pink flowers borne in late spring to early summer. Result of Rh. 'Kimberly' x Rh. 'J. M. de Montague', raised by Harold Greer, of Greer Gardens, Eugene Oregon, USA.